Whats weird to me is that Im sitting opposite the two men who composed the soundtrack to my youth. My teen years kicked off with the thundercrack at the beginning of their 87 hit Its a Sin and stumbled on through Introspective and Very. Only the Pet Shop Boys understood back then. And now, two decades and some 50 million records later, I discover that the Pet Shop Boys still understand. Even if youve never heard of them, even if the closest you get to disco is a little shuffle under a wedding marquee, I think youll agree. On their last album, Fundamental, they attacked ID cards and satirised Blairs relationship with Dubya (Im with Stupid). This time round, theyre hopping mad about Gordon Browns control freakery. Do you two always agree? Well we do worry about the same things, says Neil. We agree, for instance, that totalitarian states like Iran and China might be the future. China seems to have actually pulled off that tricky dialectic of retaining a Marxist authoritarianism with an apparent free economy and I sometimes think that its not that these states are slowly coming round to our way of thinking, were slowly going round to theirs. Is it surprising to hear a pop star drop a word like dialectic into conversation? Thats the least of it. 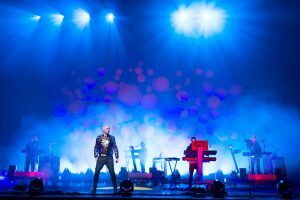 The Pet Shop Boys are not ordinary pop stars. In 2004 they composed a soundtrack to Sergei Eisensteins Battleship Potemkin; on their new album, Yes, they sing in French, reference Daphne du Mauriers Rebecca and the artist Gerhard Richter. I do. Since their last album, Fundamental, in 2006, Neil and Chris have been accused of becoming grumpy old men  Pet Shop pensioners maybe. But in person they are anything but bitter. Theyre optimistic, cheery, and if theyre worried about civil liberties, its perhaps because they have as good an ear for political phooey as they for do a tune. As Neil said in an interview with Johnny Marr (who plays guitar on Yes), Britains good at pop, we love pop. As a pop musician here you can feel part of the culture, you can comment on it in a way you might not in America. So its almost duty for Neil and Chris, once such supporters of the New Labour project, to persecute Gordon Brown, play pop-Shostakovich to his Stalin-lite. Brown is a micro-manager, its in his blood. Some part of his soul is 1970s Scottish left-wing radical, says Neil, with an exasperated sigh. In the silence that follows, I focus on a small stuffed dragon some other star has left behind on the chimney-piece. Actually our current single, Love Etc, is about shopping as well, says Chris.